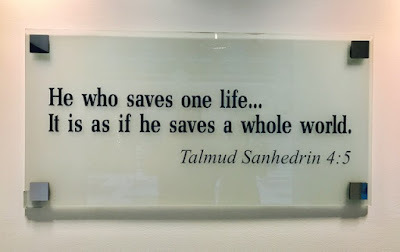 "He who saves one life...It is as if he saves a whole world." For doctors, nurses, and other medical practitioners, what greater purpose or joy in life than to save other human lives! Each person is truly a whole world unto themselves...their thoughts, feelings, and their contributions! Who knows what one single act of kindness or generosity from someone can have--what impacts down the line to one or even billions of others. Today, I have a friend that is undergoing a major operation in this hospital. My thoughts and prayers are with him. This is his third hospitalization in the last few weeks and it's time for the doctors--with G-d's help--to save his life. I actually had something similar to this friend many years ago, but the technology wasn't there yet to diagnose it, and I had to have emergency surgery where they went in "exploratory" to find out what the heck was going on. And thank G-d that they did--they literally saved my life at the time or I wouldn't be writing to you all today. I feel so grateful to G-d for his mercy to us and for giving us modern medicine and technology and all the wonderful people who work tirelessly to help all the sick people and to help save their very lives.